Clean it – Pretend you’re selling an old car or truck. Would you really show it to prospective buyers without giving it a thorough cleaning? We’re guessing not. Looks are huge when it comes to boats, especially used ones. Take some time to wax the hull, polish the metal, and add a fresh coat of varnish. Don’t forget about the inside! Keep in mind that a shampoo will remove the dirt and stains that you may not even notice at this point. Lastly, wipe down all cabinets and bulkheads using a household cleaner. You might be thinking, “I have about a million other things I could do besides clean my old boat.” This is fine if you’re willing to accept a low offer. However, if you want to make a good first impression on a potential buyer, you need to be willing to do the dirty work. Neutralize any aromas – Have you noticed a nasty aroma in your boat of late? The culprit is likely a combination of oil, mildew, and dirty blige. Pro tip: a boat that stinks isn’t going to sell. Novel concept, right? As you’re cleaning, pay close attention to the head. Should you notice any sort of funky scent, then empty the holding tank and add chemicals to neutralize it. It never hurts to leave the ports or hatches open to air the boat thoroughly. Trust us when we say that doing these things makes a world of difference. Get rid of any personal gear – Let’s say that you’re selling a house. Before a showing, you’re probably going to remove all personal items so that prospective buyers can start thinking about your house as theirs. The same holds true when you’re getting rid of a boat. Now is the time to ditch old life jackets, photos, personal hygiene items, etc. 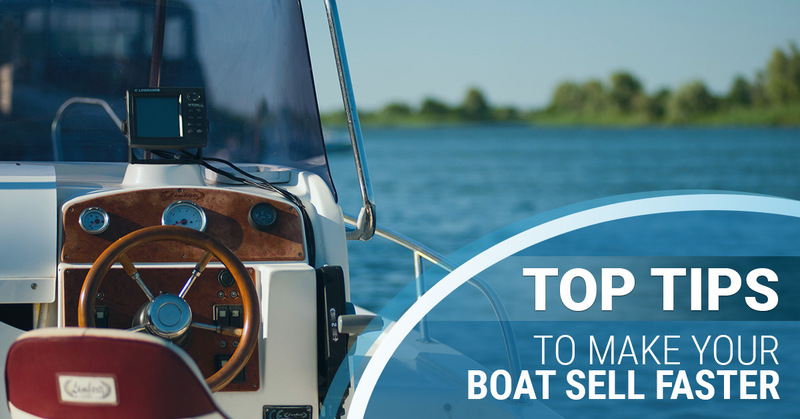 Don’t be surprised if doing so actually makes your boat seem larger. Fix it up – Nobody wants a boat that doesn’t run properly. First, double-check the “little things.” We’re talking about making sure the fire extinguishers are current, the life jackets are legal, and the flares are within their expiration dates. Obviously, the engine must start promptly. If you’re at all concerned, tune the engines and charge the batteries. Our last piece of advice here is to avoid painting over anything. Buyers and surveyors will get the impression that you’re trying to hide something. Invest in non-skid decking – Is your boat’s flooring a safety hazard right now? Then we recommend looking into non-skid decking from Marine Customs. 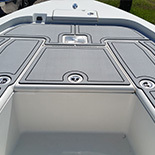 Made of EVA foam, our boat decking provides the comfort and durability you need. Our non-slip decking covers spider cracks, button snap holes from hold carpet, as well as other surface imperfections. What exactly sets Marine Customs from other anti-slip decking installers? 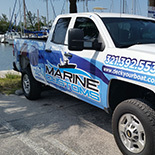 For one thing, we provide a custom, unique installation for any boat. The process begins with our custom design consultant creating a 2D digital scan of the boat. From there, the scan is imported into our CAD software where it’s customized. Maybe you’d be interested in one-of-a-kind patterns, graphics, and logos. Whatever the case, we have you covered! 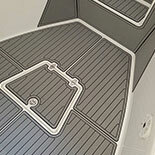 Maybe you’re interested in upgraded marine decking but would rather template the boat yourself. Not to worry. With our “semi-custom” route, you can take advantage of our Template Kits. Soon after we receive your completed template, we process it just like a normal “fully custom” installation. Once we finish the fabrication of your materials, we ship them to you for a seamless self-installation. 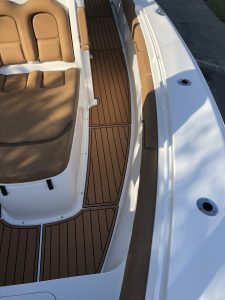 There’s no question that high-quality non-skid decking can help you sell your boat faster and for more money. See how our boat decking pros can help. Get in touch with us today.